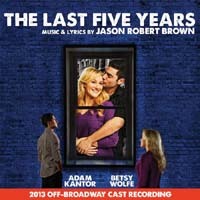 Off-Broadway Cast, 2013 (Ghostlight) (4 / 5) Jason Robert Brown himself directed an excellent 2013 Second Stage Theatre production of The Last 5 Years. With his admirably simple and straightforward approach, he completely solved all of the directorial problems that marred the storytelling of the show in its original Off-Broadway staging. Although that great virtue of the production obviously can’t be experienced by listening to the cast album, the recording is commendable in its own right for the strong performances of the very well cast Adam Kantor as Jamie and Betsy Wolfe as Cathy. There are some moments where these two seem to be working a little too aggressively to differentiate their interpretations from their predecessors Norbert Leo Butz and Sherie Rene Scott, as in several lines that are spoken or exclaimed rather than sung. Still, overall, Kantor and Wolfe are compelling and highly listenable in these roles. Not surprisingly, Brown does a superb job as musical director, a capacity in which he served for all three presentations of his masterwork that are reviewed here. — M.P. 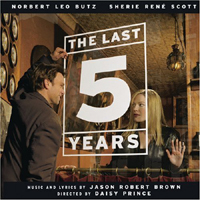 Film Soundtrack, 2015 (Ghostlight) (5 / 5) There are no significant changes or variations in the musical and textual content of The Last 5 Years among the three recordings of the score. The instrumentation is very similar if not exactly the same, down to the keys in which the songs are performed. And because of the way Jamie and Cathy are written, there isn’t a whole lot of latitude for widely varying interpretations of the roles. So a preference for any of these recordings over the other two — if, indeed, there is a preference — will depend on one’s feelings about the quality and timbre of the voices of the cast members. Jeremy Jordan is arguably the most vocally gifted of the three Jamies, and he acts the songs at least as well as Norbert Leo Butz or Adam Kantor, so some listeners will find his performance to be the most satisfying overall. Anna Kendrick is wonderfully real as Cathy throughout the character’s wide emotional and vocal range. Over the years since it was written, The Last 5 Years has dated slightly in some of its specifics; for example, in the song “Shiksa Goddess,” when Jamie imagines all the weird things about a girlfriend that his mother would be willing to forgive as long as she were Jewish, he cites having a tattoo as a major oddity. (Can you imagine?) But the characters and the main concerns of their story are timeless, so new productions and recordings of this beautiful, heartbreaking chamber musical will always be welcome. It’s best to experience the film of The Last 5 Years in a movie theater or on home video, because Richard LaGravenese did such a fine job of directing the property for the screen, but the soundtrack recording is thoroughly enjoyable as an audio-only entity. — M.P.